I think I'll knit the bra for myself...coutanApril Fool's! Lol! Maybe that isn't a bad idea. 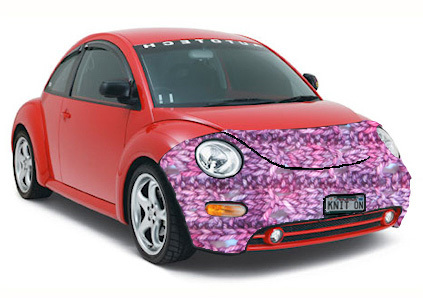 Shouldn't every knitter knit one for their car?! Just my size! I'll call it a Brawl....Half Bra/half shawl! Will I be able to adjust this pattern to fit a full size van? Oh crap, I totally forgot that y'all would need different sizes to fit your cars... thinking if you just go up (or down) needle sizes to change your gauge that should do the trick! OK - it took me a second - just one to get the joke. A suggestion for the videos for us ipad, ipod people. You can just put the youtube link on the email and we can watch there. I just typed the link and was able to watch on my ipod. I can't wait until Monday. I forsee a whole new line of designs: next, snow tire socks (for storing your snows in style). has anyone else noticed the entrelac look of the catalytic converter connectior? MUFFLER's...real wooly mufflers!